The SATCOMBw communications satellite system comprises two COMSATBw satellites. Image courtesy of EADS. The COMSATBw satellites are positioned in the geostationary orbit. Image courtesy of Airbus DS GmbH. The COMSATBw satellites provide military satellite communications for the German Armed Forces. Image courtesy of Airbus DS GmbH. 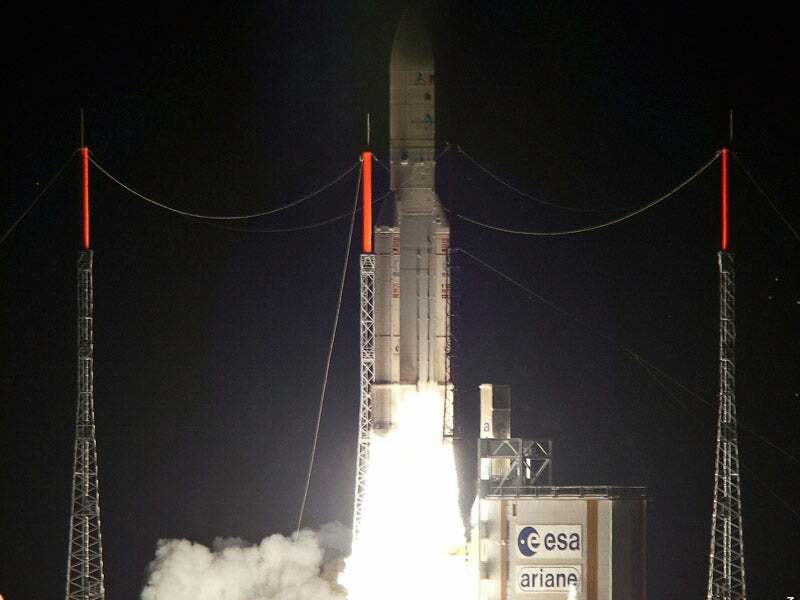 The COMSATBw military communications satellites were launched by Ariane 5 ECA heavy-lift launcher. Image courtesy of ESA/CNES/Arianespace. SATCOMBw satellite-based communication system is developed to meet the requirements of the German Armed Forces (Bundeswehr). It consists of two multi-mission military communications satellites, namely COMSATBw-1 and COMSATBw-2. The multi-mission satellites facilitate reliable and secure communications between the military authorities, government and armed forces deployed globally, from the Americas to Eastern Asia. Their applications include voice, fax, database access, video and multimedia. SATCOMBw is the first owned, dedicated communications system of the German Armed Forces. The German Aerospace Centre’s (DLR) German Space Operations Centre (GSOC) is responsible for monitoring and controlling the spacecraft. The satellites’ ground stations are located in the DLR’s Weilheim Ground Station Complex. The German Armed Forces awarded a contract to a team led by MilSat Services in July 2006, to carry out SATCOMBw stage 2 military communications programme for ten years. The contractual scope included in-orbit delivery and operation of two communications satellites, development of anchor station and ground user terminal segment, as well as modernisation of the central command, control and network management centres located in Germany. MilSat Services, headquartered in Germany, is jointly owned by Airbus Defence and Space (formerly EADS Astrium) and satellite network specialist ND SatCom. Airbus Defence and Space is the prime contractor for the entire space segment, in-orbit delivery of the satellites, and ground testing. It awarded a sub-contract to Thales Alenia Space to design, build, integrate, test and deliver COMSATBw-1 and COMSATBw-2 satellites. Tesat, a subsidiary of Airbus Defence and Space, supplied the payloads. Airbus Defence and Space also supplied 500 ground terminals. The German Armed Forces procurement agency (BAAINBw) awarded a contract worth €145m ($163.7m) to Airbus Defence and Space in March 2016 for in-orbit operation of the SATCOMBw until 2022. The company also agreed to operate the satellite system‘s teleport and associated networks located in Weilheim, Germany, until 2022. The COMSATBw-1 military satellite was launched in October 2009 and is positioned on the geostationary orbit at 63.0° east longitude. The COMSATBw-2 satellite was launched in May 2010 and is located at 13.2° east longitude. The two COMSATBw multi-mission satellites are based on Spacebus 3000B2 platform, developed by Thales Alenia Space. Each satellite is 2.8m-long, 1.8m-wide and 2.9m-high, and has a launch weight of approximately 2,500kg. It is capable of delivering a payload power of 3.5kW. The orbit altitude of the satellite is 36,000km and the design life is 15 years. "The multi-mission satellites facilitate reliable and secure communications between the military authorities, government and armed forces deployed globally, from the Americas to Eastern Asia." The satellites’ payloads include SHF (super high frequency), UHF (ultra high frequency), X-band, and Ku-band transponders. The military communications satellites were launched aboard an Ariane 5 rocket, owned by Arianespace, from Guiana Space Centre in Kourou, French Guiana. Ariane 5 ECA heavy-lift launcher, an enhanced version of the Ariane 5 generic launcher, is designed to place payloads weighing up to 10,500kg into geostationary transfer orbit. The launch vehicle integrates three stages. The cryogenic main core stage is powered by a Vulcain 2 engine with 175t liquid oxygen and hydrogen propellants, and is coupled with two 240t solid propellant boosters. The cryogenic upper stage uses a HM7B engine with 14.7t liquid hydrogen and oxygen propellants. The payload fairing at the upper part protects the payloads at launch and during atmospheric flight.